Almere dates from 1976. 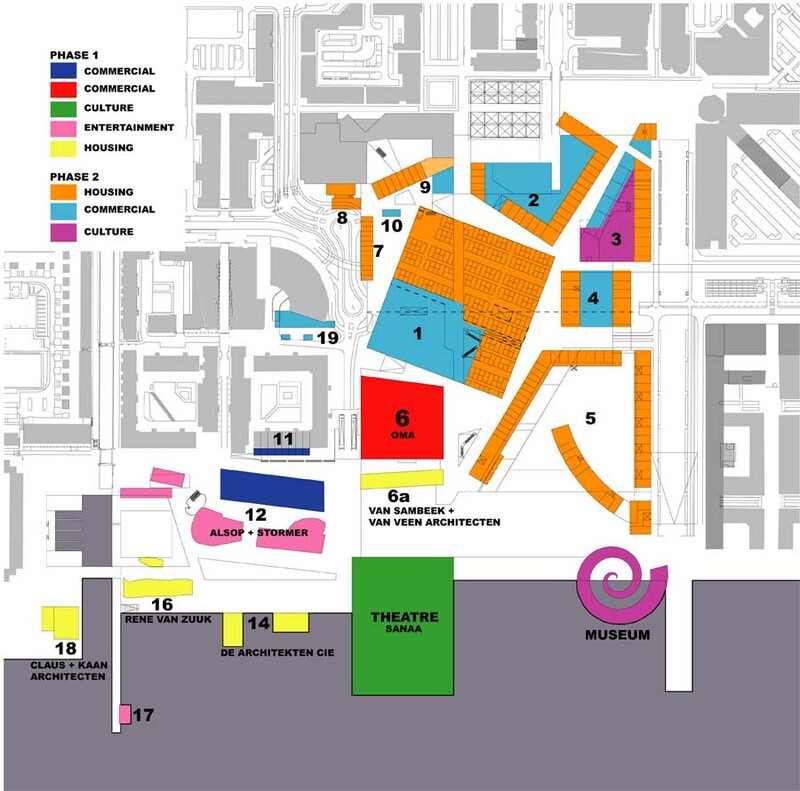 OMA won the competition to design the centre in 1994. Largely complete in 2007 some buildings are still being finished, eg Block 3. In an RIBAJ interview (Jul 2008) with David Chipperfield he states “you can’t expect everybody to start completely afresh with a type of architecture they can’t read….The tension lies between the role tradition and invention have. If you just have tradition, you don’t go anywhere”. By the same token, if you just have innovation you ‘don’t go anywhere’ either. The problem with many New Towns, eg Milton Keynes or Cumbernauld, is that memory is erased and tension hasn’t been born. 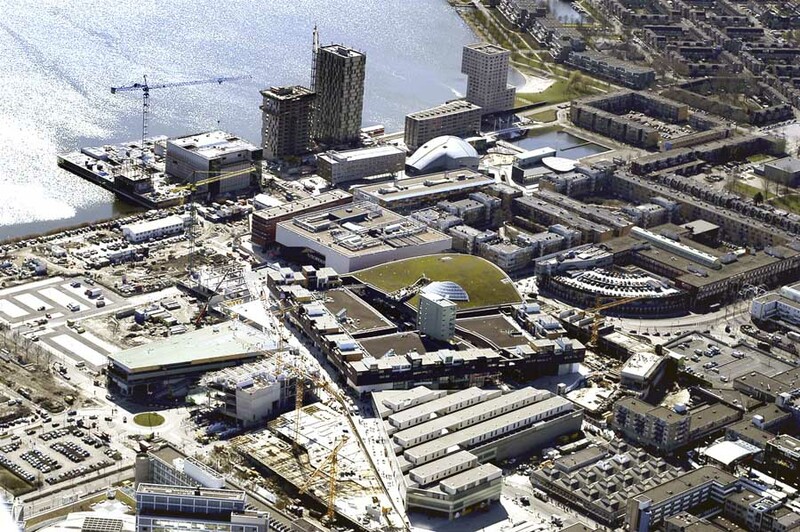 In The Skira Yearbook of World Architecture 2007-2008 Nicola Russi tries to tackle OMA’s Almere Masterplan – ‘Omaville’. Nicola focuses on the ‘voids’ – half the land was apparently left empty to allow for future development. Nicola also highlights the distance of the new civic centre ‘magnet’ (ie the main mass of retail buildings) from the water and that by “refusing to construct the project in relationship to a context, the OMA intended it to become a context in its own right”. Sounds bold, but have OMA really ignored context? I arrived in the city on purpose without a map and tried to navigate my way to the centre. I’d also located information on the Centrum but purposefully read it only after my visit. So I walked back and forth through the masterplan with innocence trying to evaluate not just how I felt about it but how the occupants were feeling about it. The first thing that struck me was the easiness of transition from old city centre to new, mediated of course by the fact both are relatively new. The scale and density are harmonious, though a little harsh on the north side where buses slot under the building, but this is what transport does, it alienates the pedestrian. The majority of the masterplan is very pedestrian friendly – spaces rise and fall, widen and narrow, all free of the threat of vehicles. This subtle spatial variety provides a soft dynamic that underpins the assembled individual architecture statements. OMA’s development of the plan (see diagrams below) show a central square that is fractured with non-retail buildings scattered to the west along the water’s edge. 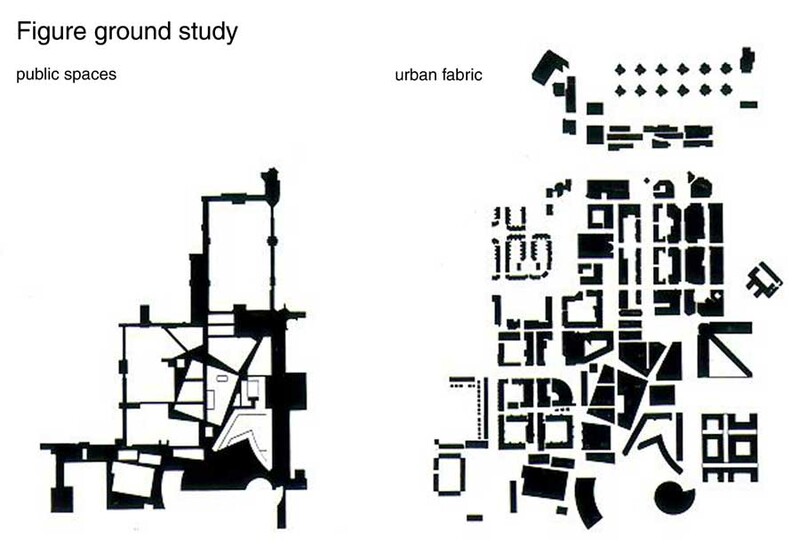 The diagrams look attractive but more importantly the spaces are human-scaled and varied. Equally what could have been an architectural zoo is a cultured set of buildings that relate to each other. Terracotta coloured fascia banding connects the central buildings (by Portzamparc) but in my view isn’t stifling. A wide range of materials and styles is evident in the other buildings but they don’t jar or jostle. As the ground slopes down to the water the spaces open up and also become less occupied. The boundary of land and water is not fully celebrated, perhaps this can be addressed in the coming years. SANAA’s Arts Centre in some ways acerbates this disconnection, its solid mass blocking out views to the water. But on the whole this is a successful new city centre, surely one of the most difficult challenges an architect’s practice can be faced with. 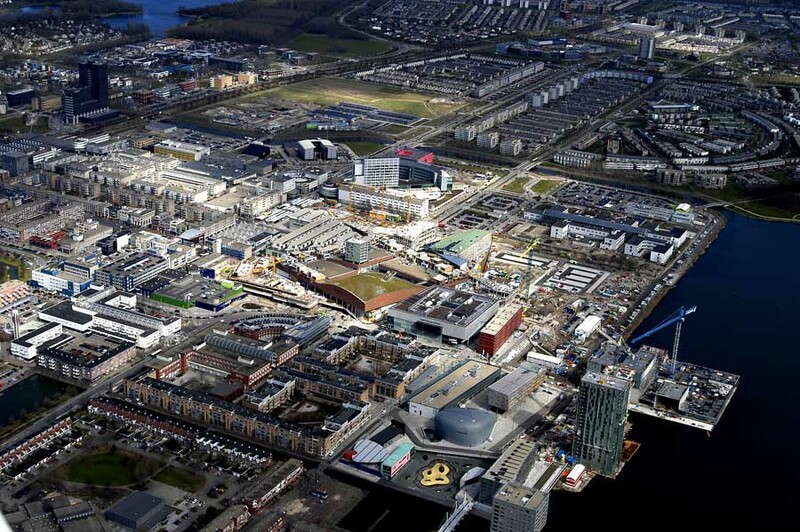 Compared to the earlier stolid retail areas (to the east) OMA’s urban redevelopment is highly attractive. Almere, now over 100 000 inhabitants, has existed less than two decades. In that short time the city has demonstrated enormous potential and vitality. It has shown a commitment to architectural innovation and experimentation. 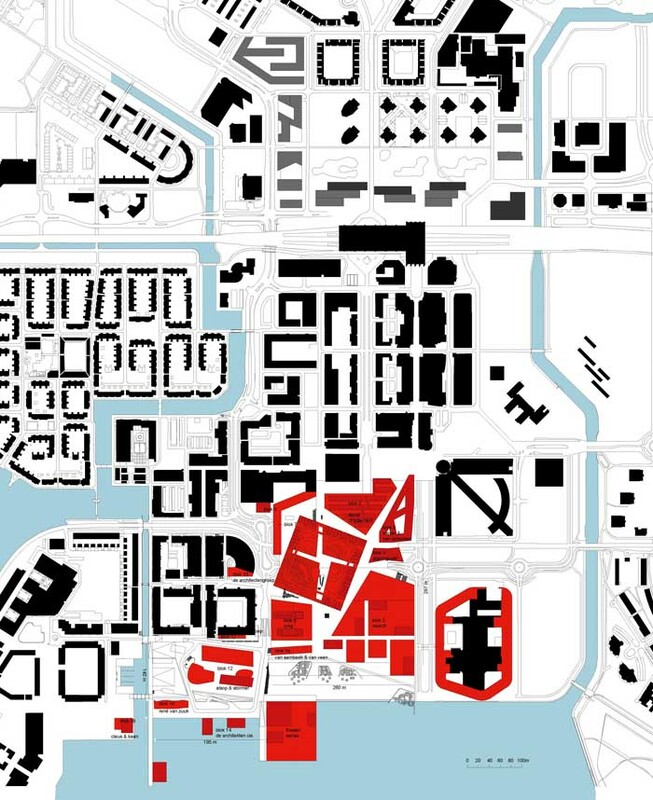 Almere will soon reach the critical mass that will enable it to redefine its ambitions; ten years from today, the population will approach that of an average medium-sized city. Then it will be possible to make the quantum leap from an agglomeration of distinct “equal” centers, each with its own concentration of facilities, to a city with a recognizable hierarchy in the programmatic development. This growth will provide the city center with the basis for a number of essential facilities; such as a cultural nucleus (museum, library, theatre) and large scale retail facilities. The center of Almere also offers the combination of easy accessibility by car and train, and the availability of building sites, both on the periphery as well as in the center. This means that an new urban office park can be developed in the center with accessibility and visibility equal to a peripheral location. To mark the quantum leap in Almere, OMA decided to concentrate new program for city and business center on only two sites: between the town hall square and the boulevard alongside the Weerwater and between the station and the planned Nelson Mandela Park). 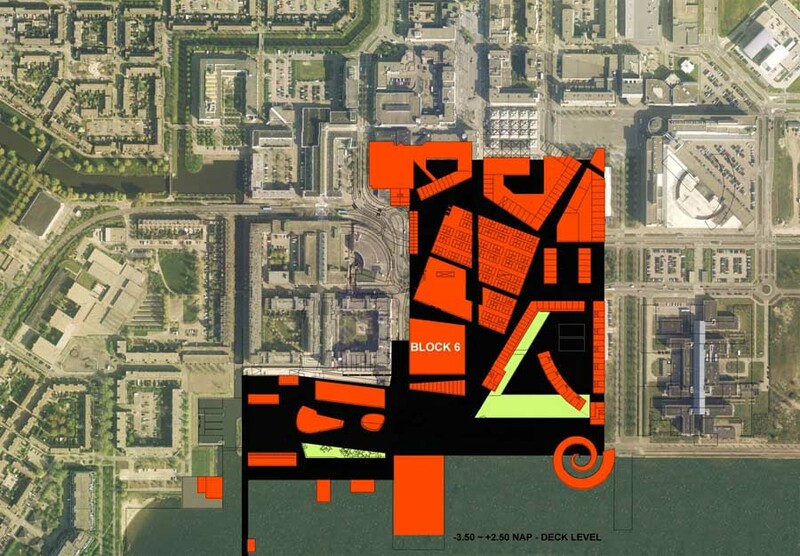 This concentration is essential for the unambiguous delineation of Almere’s new status. 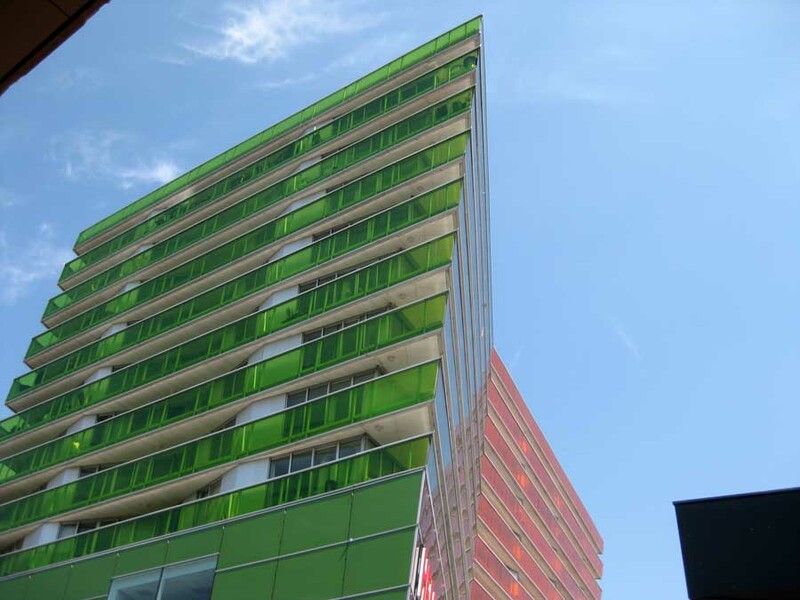 It will also make it possible to create a new and recognizable form contrasting with the existing, low density elements (specialist retailers, small-scale offices) which make Almere what it is today. The chosen density means to build a 130 000m2 office complex north of the station, taking maximum advantage of its location. The density of the shopping complex means that the boulevard can be freed from the planned commercial program leaving space for cultural and leisure programs. This concentration also offers the opportunity to create a – diagonal – short cut between the two shopping districts. The strip to the east of the center will be preserved from immediate development which offers an attractive location for a new expansion initiative at a later stage. The next phase of the urban design is a cooperation between consultants from private development agencies, OMA, engineering consultants and a special agency of the City of Almere (project bureau). The OMA competition design has been further developed in this stage and has been tested on the criteria of functional and financial feasibility. Almere is a poly-nuclear agglomeration, traffic and zoning are hierarchies in a sixties fashion. The functional separation is maintained in the existing center as well, which – in its form of a grid fakes a “traditional” city. Our proposal superposes pedestrians and buildings on top of a layer that organises all infrastructures, creating a density of public presence in the (new) center as a place “other” than the existing city in terms of density, spatial diversity and orientation to achieve a place of maximum public interaction. In this stage the private development agencies defined in detail the commercial programs for the center. The mix of program is composed of approx. 67.600 m2 commercial, 9.000m2 leisure, 890 housing units, 3300 constructed parking spaces. The program includes also a new library, a hotel, a pop music hall and a theatre. The commercial concepts were tested on the proposed urban blocks and the hybrid combination of programs. The boulevard alongside the Weerwater is utilised for leisure, nightlife and cultural programs to achieve a vital waterfront. The office complex has been developed in further detail. Similar to the City Center, a sloping plane (covering a carpark) gives pedestrians access to the office buildings. The plinth of each building consists of service programs (copycenters, conference rooms, employment agencies shops etc.) complementary to the offices above. Towers are placed tightly to allow horizontal connections through “bridges”. The configuration allows bigger buildings composed of smaller and – for corporate identity – district units. Construction of the first building started in December 1998.